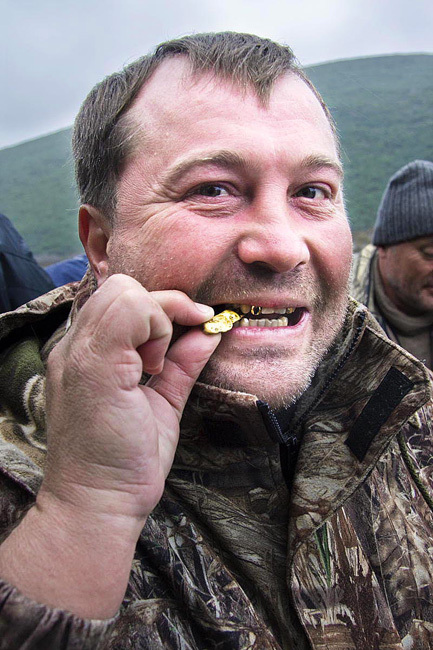 Kolyma is home to one of Russia's most abundant gold mining regions. On this picture we can see gold prospectors against the backdrop of a typical gold mine. Water is piped from a reservoir to flush the gold-bearing ores and separate the gold in a rinsing device. Then a fragmented gold-bearing ore is loaded into the hopper of the rinser. 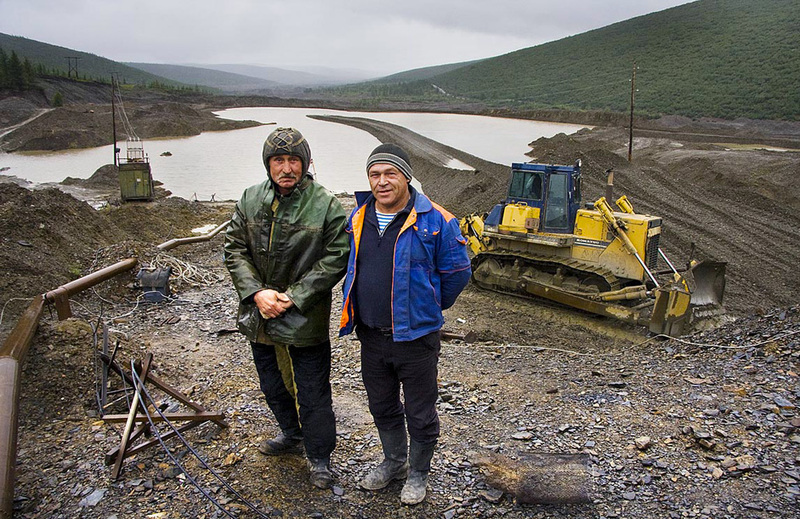 The Kolyma region is located in the far north-eastern area of Russia in what is commonly known as Siberia but is actually part of the Russian Far East. The principal town, Magadan, with a population of 99,399 and an area of 18 square kilometers, is the largest port of north-eastern Russia. Fishing companies as well as gold mining works is the city's industrial base. Here the operator controls the hydromonitor to release a jet of water. The stream from the water cannon under great pressure turns the gold-bearing ore in the hopper of the rinser to liquid pulp. 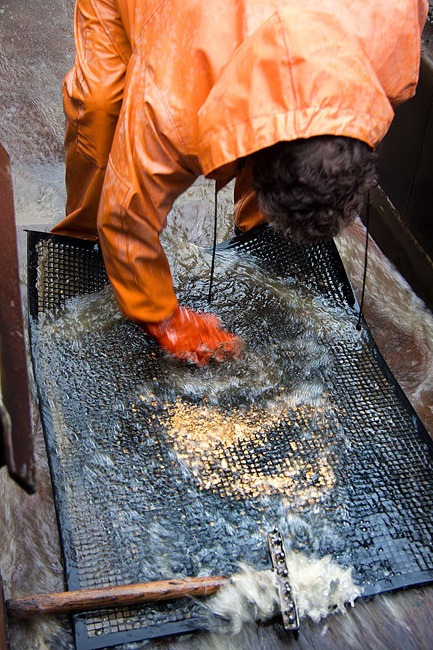 The pulp enters the trough (pan) of the rinser.The gold settles under its own weight in the ribbed rubber matting inside the trough, while the lighter ores are washed away. The next step: the lighter ores are poured out of the rinser together with the water. 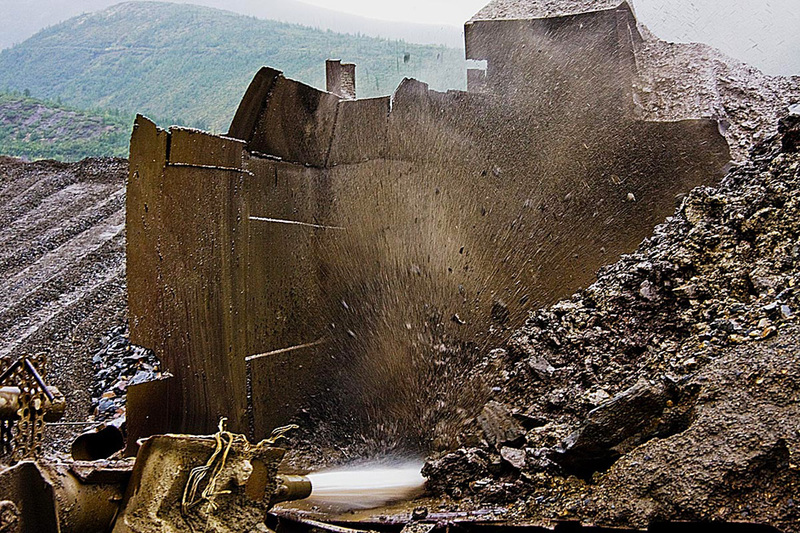 A bulldozer clears a passage for the flow of water. 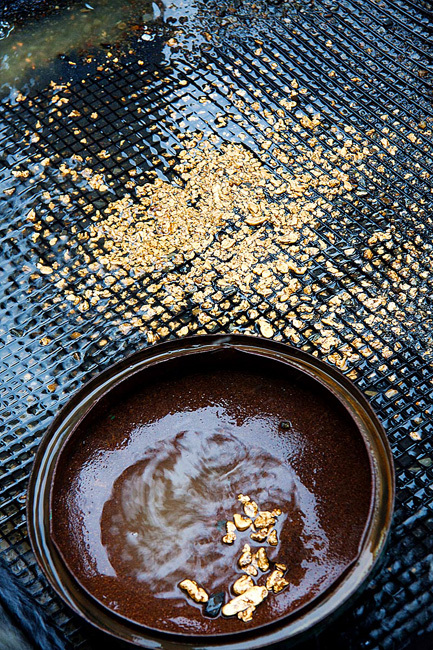 Workers open the lid of the trough and set about collecting the gold. Flushing the mats. Large chunks of ore are removed first. Most notably from the so-called anti-Kulak campaign and the government's internal war to force collectivization on the USSR's peasantry. These prisoners formed a readily available workforce. Today working there is voluntary, of course, though the whether conditions are still severe. At least, people seems to look rather cheerful. The gold is given the old-fashioned bite test - for the photographer only, of course. Gold is removed several times a day. "Golden harvest" is the amount of gold recovered depends on how much was contained in the rock loaded into the rinser. 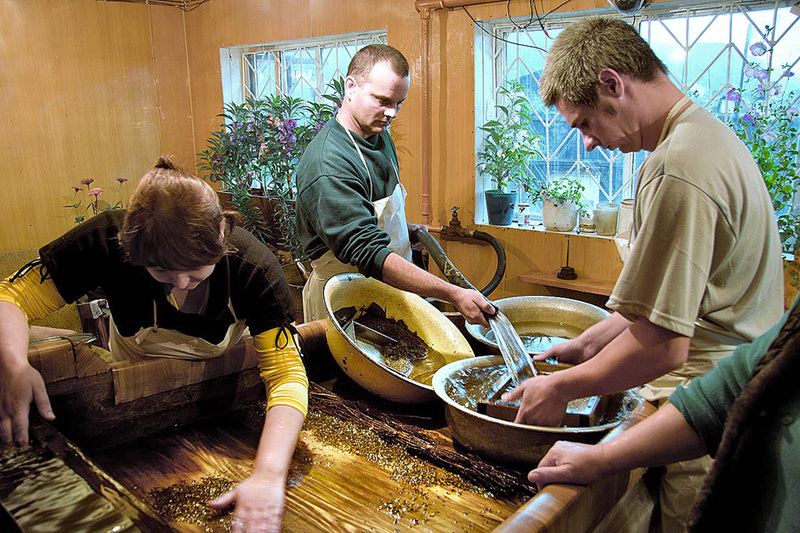 Ore containing small particles of gold is washed in a special room back at the prospectors' base. 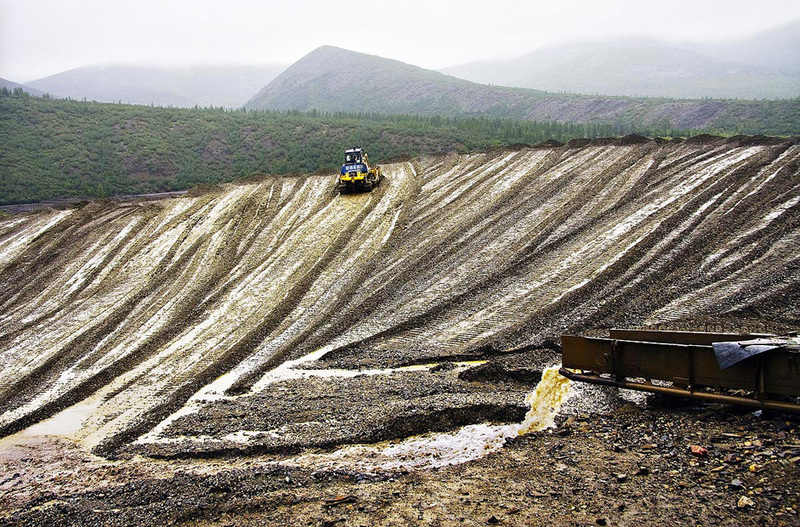 Operations at the Shturmovoy gold field (pictured) in the Yagodinsky district of Magadan Oblast began in 1934. Soon afterwards, in 1935, construction work began on a miners' village. 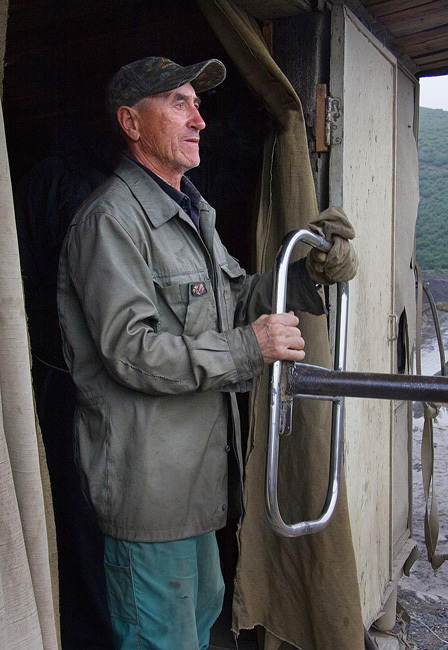 In the 1990s, the miner settlements at Kolyma began to shut down. 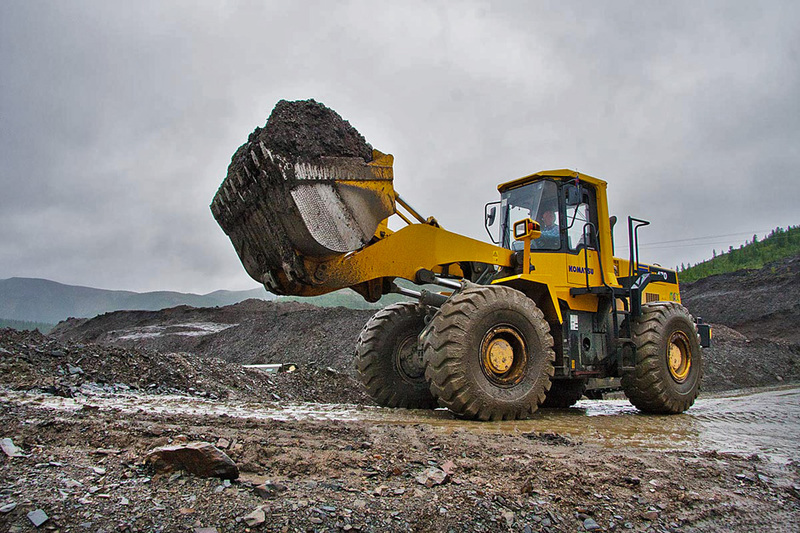 The Shturmovoy field is currently being developed by mining cooperatives with teams operating in shifts. 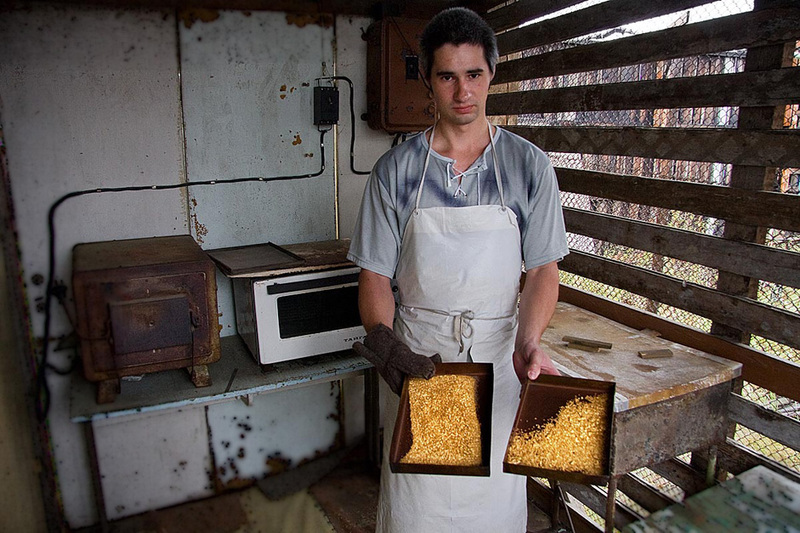 Gold is produced using the open-cut method several months a year in warm weather. Gold extracted at the base undergoes a series of chemical manipulations before being loaded into special containers and transported to a refinery to be made into ingots.